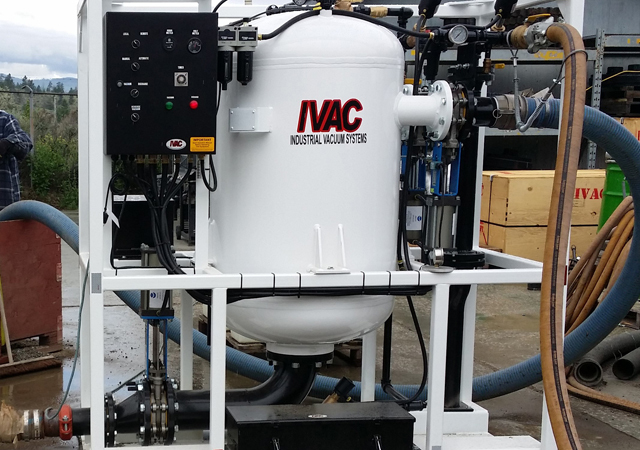 The PV500 is our deluxe sand, sump, rock, slurry, and water handling industrial vacuum system. The PV 500 is designed to transfer material under vacuum in mining, chemical, construction and offshore drilling applications. The pump is capable of transfer rates up to 8 m³/hour, material dependent, all while delivering the same through its 4” discharge port. Skid Mounted c/w forklift lift points. The unit cycles from vacuum to discharge when the pressure vessel is filled with the material being vacuumed. The automatic cycle is set by the operator on a timer located in the control box. Overfilling will not damage the unit. Material being vacuumed does not come in contact with any moving parts. Handles wet or dry material, sludges, slurries, sand, gravel, and rock. Batteries are good for approximately one-month continuous operation before recharge. Virtually maintenance free as there are only three moving parts (knife, gate, valves). Pumping up vertically over a typical pumps 28 feet is easily achieved with our suction assistant. Slurry, sludge removal and transfer. Oil sludge, tank bottoms residual removal and transfer. Barge holdings and vessel bottom clean out. Bulk tank and silo transfer of material. Sand; course, fine, conventional and frac sand. Hazardous waste removal with close circuit transfer.